It is not very often you get to meet a World Champion let alone train with one. VeloPro is proud to announce the launch of TEMPO remote. TEMPO remote is the first offering from the VeloPro Affiliate Program. It combines VeloPro's dynamic training plans with the hands-on and in-studio experience of multiple time National and World Track Cycling Champion Kirk Whiteman. 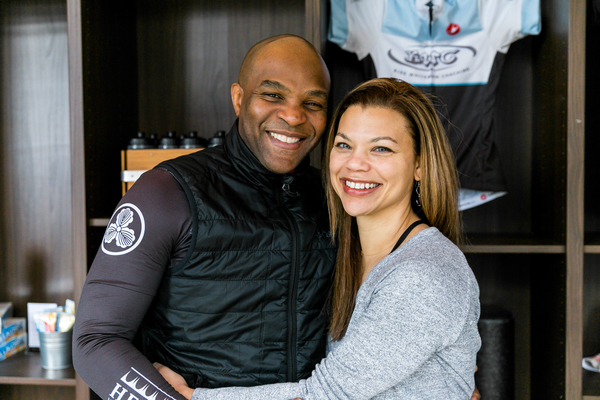 Kirk and his wife Jenny, a pilates and balanced training expert, co-own TEMPO cycling and pilates studio in Portland. They help cyclists of all levels get into shape and then some! Kirk and Jenny's athletes have won 24 World Championship medals, including 10 crowned World Champions, 73 National Championship medals, and 55 OBRA Track Championship medals. VeloPro: Jenny, TEMPO cycling and pilates studio is a unique concept. How did you come up with it? Jenny Whiteman: TEMPO studio is in its second incarnation. Kirk and I met in Brooklyn New York and in 2001 we opened our first studio in Park Slope. We decided to blend more than just our lives then but also our passion for teaching. VeloPro: What is balanced training? Jenny: Balanced training means we work the whole body. Whole, in the sense that it's not just fitness to us, it's an experience that softens your strengths, limits your weakness, and challenges your mind. Our goal is to maximize your effort by working efficiently. VeloPro: What are the benefits of balanced training for cyclists? Jenny: The benefits of balanced training for cyclists are increased pedal efficiency, power and control of the bike. Most cyclists have overworked quads, hip flexors and chest muscles so we focus on lengthening those muscles while strengthening potentially under-utilized muscle groups: being the hamstrings, glutes, lats and of course, abdominals. VeloPro: How does Tempo build pilates into cycling training? Jenny: We incorporate pilates into every cycling class with cues to "draw the belly button back to the spine, lift the hamstrings, relax the shoulders down away from the ears." It's a mantra that many of our clients will tell you they hear in their heads while out on road rides. Multiple coaching clients who've taken my pilates class before training have set power PRs! I'm really optimistic about the results our TEMPO remote + members will gain by incorporating Pilates into their training programs. It makes a huge difference! VeloPro: Coach, TEMPO is the name of your cycling studio, a riding speed, and of type of workout. What is tempo in cycling and why is it important? Coach Kirk Whiteman: Our approach at TEMPO is to get people to realize that we all work at different frequencies, they might be close, but they are different. Once we help them establish what that frequency or tempo is, then we teach and train them to work in and around those parameters; from there, the rest of the training is relatively easy to progress. VeloPro: As a world track cycling champion and the coach of champions, how do you and your athletes use tempo to train and win? Kirk: It all depends on what we are doing and what the purpose is. We use tempo for strength, power, speed, endurance and sometimes no tempo at all. Helping athletes achieve high levels of excellence requires communication and a flexible mind that can adapt to any and every situation they encounter. This is a top priority. This presents to anyone who “might” have an idea that they would like to be champion, a reality! Of course, there are exceptions, but the bottom line is, be the best that you can be for you! VeloPro: Tempo is one of those skills that seems to be hard for a beginning cyclist to master. Can you give us a few tips on the best ways to approach learning how to ride Tempo? Kirk: We start with the basic concept of “what’s work for you, is work for you.” From there we look to find what drives and motivates the athlete in the making, because everyone is an athlete in the making. Tempo begins when we find common ground, we make a plan, and from there the “Sky’s the Limit!” Simple!